Soon after moving into the house we now live in, a friend from church offered me a greenhouse. I was both grateful and humbled. It took a while before I was able to clean our backyard up enough to place the greenhouse in its current location. Once that was done, it took some time determining what kinds of containers I could use for the greenhouse. Initially a friend said that he could provide some shallow containers, which probably would not have been the best in the long-run. Note the west-side shade. This is intentional to prolong my spring transplants. 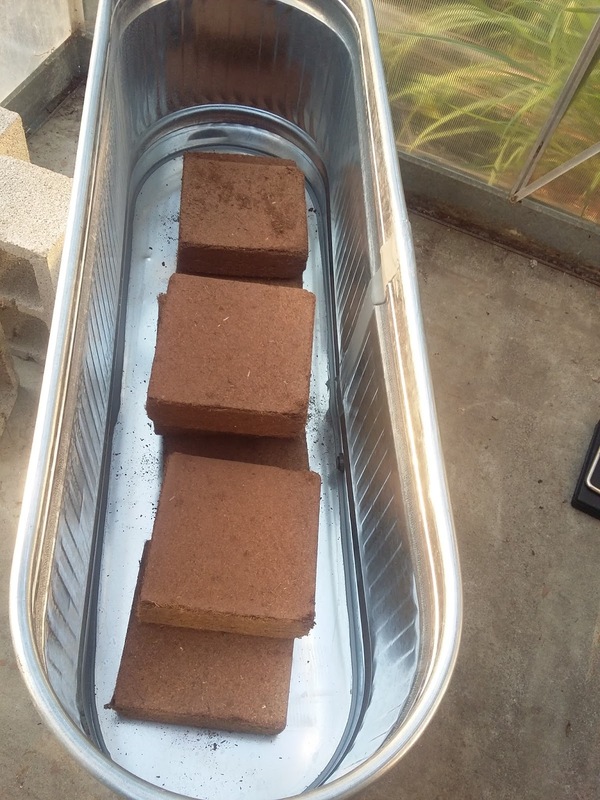 Coconut Fiber (Coir) Blocks in my new stock tank. After finding that more shallow containers could not be procured I got tired of having the greenhouse mostly vacant, so I purchased a (nearly) 6’ long by 2’ wide feed stock tank – like the kind used for providing water for livestock. With that done, I then had my father purchase some coco peat fiber blocks or coir from Santa Rosa. These were reconstituted while I sprouted my transplants. Though I normally do not do transplant, sometimes it is the only way to get plants large enough in the time I have. 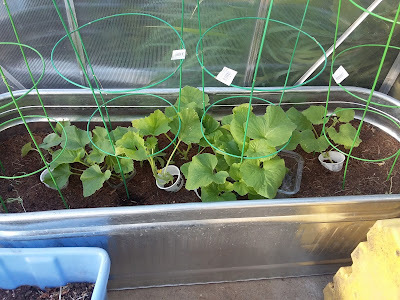 The transplants were potted into the stock tank about a month ago and, despite our diminishing sunlight this fall, they are still growing well. Carosello Growing in compost, but losing ground to woodlice. Some plants have been chewed up so much, that they needed to be removed. One unfortunate thing that I did do was I sifted some compost to help in feeding the small plants. The compost itself was not bad, but the pill bugs or woodlice that came along in the compost decided to start chewing on my plants. I had no idea how destructive they could be! 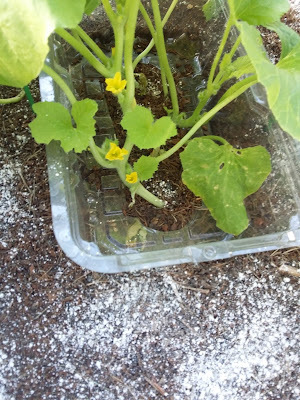 Once they had damaged most of my cucumber plants enough that I was getting pretty desperate the inspiration finally hit me. 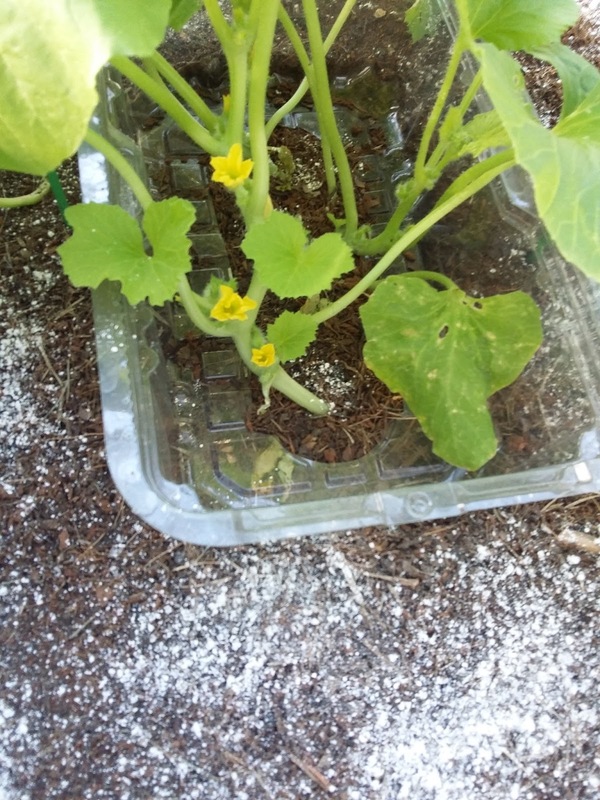 I could just sprinkle some diatomaceous earth on top of the soil. At last – an organic solution for self-contained invertebrate pests in the greenhouse! Diatomaceous Earth may not look pretty, but it works! The only place tomatoes have a semi-permanent home in my kitchen is on top of the refrigerator. While I would never put home-grown tomatoes into the refrigerator because the flavor suffers dramatically, store-bought tomatoes may have already been chilled, and as a result – have poor flavor. Though most tomato connoisseurs can only describe the significant degradation of flavor in qualitative terms, a 2016 study demonstrated that there are actual chemical changes that take place when tomatoes are stored at cold temperatures. The study does a good job of demonstrating to even the skeptics why you should never put your tomatoes in the refrigerator. From late June until now, there was only one week where we needed to purchase a few tomatoes. We use about 5-7 pounds of tomatoes each week. There were several weeks where the tomatoes would not fit on the refrigerator. We sold the excess and made at least $40. In fact - selling tomatoes enabled of my children to buy a pet! If I were to quantify only the amount we ate in monetary value, it would be between $80-$150 if tomatoes were only $1 per pound. However, money alone cannot quantify the qualitative benefits of a meaty, slightly salty, savory, fully-flavored home-grown red ripe tomato.